My favorite thing to do is sit and hand quilt. Through the years, I’ve done most of my quilts by hand. I’m nearing the end of “Feathered Cheddar” and looking forward to putting a binding on it. While I’m quilting, I’m dreaming of the next hand quilting event… what should it be? Bill’s blog over at Wonky World is causing me to consider an “intense quilting event.” Check out the last few posts of his beautiful antique Album Quilt. Oh my, my heart is singing! 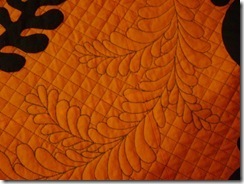 While I love the album style applique, it’s the quilting that has my attention. Just look at how close that is! I know what you mean and I am always dreaming of the next quilt while I work on the 2 or 3 that I am normally working on. The Cheddar quilt is looking really great! The hand-quilting is my favorite part too, especially in winter! Your cheddar quilt is so lovely. That is amazing quilting on Wonky World….oh MY. 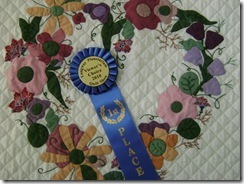 Your feathered cheddar quilting is spectacular! I'm not good at hand-quilting at all. 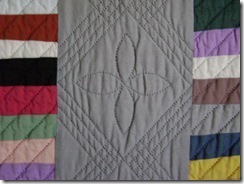 One of my goals for 2011 is to improve my machine quilting. Pretty much all I do now is stipple, which I love, but there is so much more out there that is possible. Improving my hand-quilting is a much more long-term goal for me. Your skills are AWESOME!